This is the least shocking story of the day. Boehner doesn't have the balls to have the House arrest Lois Lerner for contempt and Eric Holder will never do it. That leaves the contempt vote as a toothless show vote to placate the base. Boehner can go back to working on his tan and golf game now. The House has held Lois Lerner in contempt, but it won’t use its power to place the former IRS official under arrest, Speaker John Boehner (R-Ohio) said on Sunday. Under a precedent affirmed by the Supreme Court, each chamber of Congress can authorize its sergeant-at-arms to detain individuals it holds in contempt. But Boehner said on "Fox News Sunday" that he has no interest in doing that with Lerner, whom the House last week voted to hold in contempt over her refusal to testify about her role in the IRS’s targeting of conservative groups. “I’m not sure we want to go down that path,” Boehner said. “It’s never been used,” he said of the provision allowing Congress to arrest individuals and place them in the Capitol jail. The Senate has in fact used that power, but not in the last 80 years. 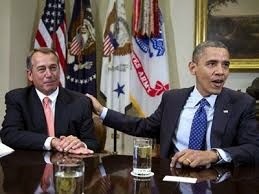 “I’m not sure that it’s an appropriate way to go about this,” Boehner said.